NORTHFIELD – His gloved hands thrusted skyward in triumph as he crossed the finish line, Roseville senior Acer Iverson looked the part of satisfied state champion. 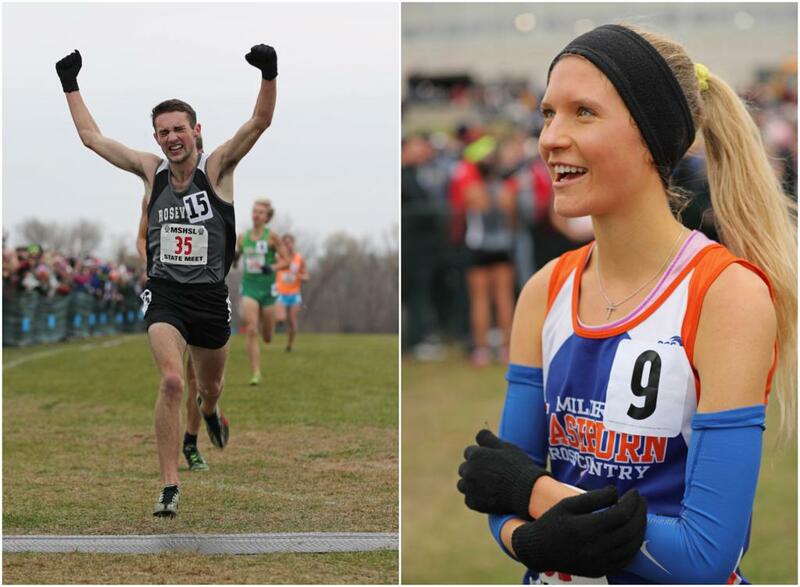 This crowning cross-country moment on Saturday was a year in the making. Iverson placed second in the Class 2A state meet last season and vowed to return stronger. He covered the 5,000-meter course at St. Olaf College in 15 minutes, 14.8 seconds, just ahead of seniors Andrew Brandt of Wayzata and Maxwell Manley of Edina. “Coming back this year with everything we learned, training twice as hard, being five times as dedicated — it really paid off and it feels wonderful,” Iverson said. About 2 miles into the race, Iverson overtook Stillwater senior Addison Stansbury, who 10 days earlier had posted the state’s fastest time this season. “I tried to picture myself being patient so that when it came to the final kick, I had the amount of energy and the position I needed,” Iverson said. Coach Brian Bailey praised Iverson’s approach. “He got a second chance at winning a state title, and he ran his race beautifully today,” Bailey said. Manley led Edina to the school’s first cross-country state title. The Hornets, who placed second in the Section 6 championships, scored 88 points to defeat Mounds View (99) and section winner Wayzata (112). Less if than how fast, Emily Covert’s Class 2A title defense fell just short of expectations in the latter category. Covert, a senior at Minneapolis Washburn, won in 17:03.4, a mark good enough for a meet record but just shy of her desired pace. “I was a little bummed out when I didn’t get a sub-17, but that’s OK,” Covert said. Earlier this season, Covert became the first female to run a 5K in less than 17 minutes in a Minnesota high school race. This is the fourth season that girls’ races are 5,000 meters in length. Covert finished 25.4 seconds ahead of Farmington teammates senior Lauren Peterson and sophomore Anna Fenske. Fans jockeying for position near the finish line greeted Covert with applause. “I wanted to cap off my high school career with a bang, I guess,” Covert said. Covert, who recently committed to Colorado, concluded a decorated fall distance-running career. Meanwhile, St. Michael-Albertville made history with its first cross-country state title. The Knights edged Wayzata 70-75 thanks in large part to No. 4 runner Jessica Immer and No. 5 Anna Belair. They both finished ahead of Wayzata’s fourth and fifth runners and provided the winning margin. Edina (87 points) placed third. Coach Heather Strait felt her runners would finish in the top three but set their goals higher. “Edina and Wayzata are superpowers when it comes to cross-country, but our team’s thing was kind of, ‘Why not? Why not shoot for first?’ ” Strait said. Winona Cotter sophomore Grace Ping won her second Class 1A state title, but much of the buzz after the race concerned a runner who didn’t finish. Two-time defending champion Tierney Wolfgram, who competes for Math & Science Academy of Woodbury, dropped out of the race despite leading around the 1-mile mark. “She fell, and when we came out of the back loop, she just walked off the course,” said Winona Cotter eighth-grader Lauren Ping, who placed second. Math & Science Academy coaches directed questions to the Wolfgram family, which did not immediately return an e-mail. Wolfgram, a 15-year-old sophomore, finished sixth in the elite women’s field of the Twin Cities Marathon in early October. Ping previously won the state title as a seventh-grader, then spent a year competing in Utah. Injuries limited her last season but not Saturday. “I felt amazing today,” said Ping, whose time of 17:19.4 set a 1A meet record. Perham won its third team title in the past four seasons. Geno Uhrbom, a sophomore at Greenway/Nashwauk-Keewatin, won in 15:38 and crushed the 1A boys’ field by almost 20 seconds. “I went out to lead the race the whole time,” Uhrbom said. His dominance came after two former high school standouts finished the past two consecutive state meet races less than one second apart. Not Uhrbom, who glanced over his shoulder on the final stretch and found himself alone. Running this well as a sophomore hasn’t gone unnoticed. But minutes and seconds, not age, were the numbers concerning Uhrbom. The Perham boys’ team also repeated as state champion. In the latest Talking Preps podcast, Jim Paulsen and David La Vaque recap a 55-yard goal seen 'round the world and look ahead to three days of volleyball and football state tournaments.